The legend of Babbo Natale (Santa Claus) has existed in Italy since the days of World War II. However, there is even a more ancient (and equally popular) Italian Christmas tradition that has its origins traced back to the 13th century: the legend of "la Befana". Every year on the night between the 5th and 6th of January, which is the Epiphany day, (Greek term meaning "manifestation" or "appearing"), la Befana flies on her broom stick to bring presents to children. La Befana is an old hunch-backed lady with a big red nose. She wears broken shoes and a colourful patched dress. The legend has it that on the 12th night of Christmas (January 5th) the three Wise Men, on their search for the baby Jesus, knocked on somebody's door. A woman was busily sweeping her house when they came to her door. They said they were seeking the new King who was born in Bethlehem. When they asked her to show them the way, she replied that she was too much busy. Later, she felt sorry that she had not helped the three Wise Men, so she set out after them. She searched and searched, but she didn't find them. 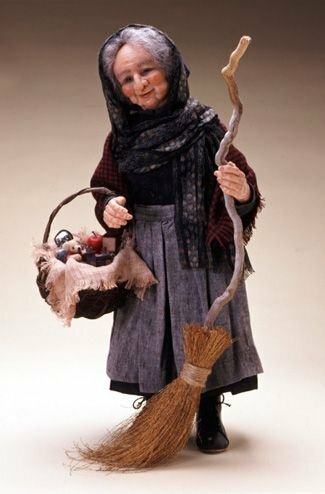 La Befana felt really bad, that's why she is still travelling on her magic broom, every year on the same night, searching for the Christ Child. She carries a big bag on her back full of sweets, which la Befana will use to fill the stockings that children have left by their chimney. The children who have behaved in the past year, will find sweets and chocolates in their stocking on the day of the Epiphany. Those who didn't behave will only get a few lumps of coal. (It's sweet coal and I love it! ;-)).